Really don't know the Model Year, but I have had these for a long time. For most of that time, they were doing duty as rear surrounds in my secondary system. Various larger speakers came and went as the front speakers. Nothing ever sounded exactly right for the room. Finally, I ditched the Fluance mini-towers that were the most recent fronts. On a whim, pulled the 215s from the rear and set them up as fronts. Just amazing! They are working hand-in-hand with a 12" AR sub from the late '90s. I set the x-over at 120 to give the 215s less to do on the low end. They seem very happy in their new role. The main problem is that I just cannot believe the big sound from these small speakers...just have to get used to that, I guess! Not much after 80 hz.What you would expect from a 5.25 woofer! Bought these when money was low many years ago.These sounded good by themselves with a 100 watt pioneer receiver.I then added a sub from my ht system and they sounded even better.I upgraded to a 140 watt elite receiver and wow!I got a pair of mmg maggies and did a a-b comparision and ended up sending the mmg's back!Don't get me wrong, the mmg's are great sounding speakers, but 10x better?Maybe I did not let them break in,I even purchased a adcom 350 watt 4 ohm amp,thinking that would help and it did a little but I just dropped close to $2000 to get a better sounding system.The ar's definitely did not need the adcom so it went back also.Basically what I'm saying is that these speakers are a great value! Nothing with value like this! Excellent clarity, midrange, and bass. Astonishing performance for the price. Slightly "boxy" sound at loud levels. I had read a very positive review about these speakers in Consumer Reports. 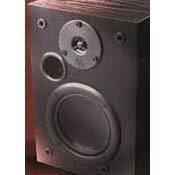 (CR ranked them eighth out of thirty-some speakers tested, which ranged in price from $250.00 to $600.00.) And at the price, I couldn't pass them up! I hooked the ARs up to my Marantz amp and tested them by playing various CD tracks such as Bernard Hermann's "Seventh Voyage of Sinbad" (the percussion in the piece jumps from speaker to speaker and the horns really test the tweeters); the Jupiter movement from "The Planets" (Steinberg/Boston Symphony), a great piece for soaring strings, horns that seem to be in the room with you, and very bright percussion; "So Easy" by the George Gruntz Concert Jazz Band, a beautifully recorded big-band track; and many other jazz and classical selections. In each case, the highs were very clear, the bass sounded full, and the midrange natural. Overall, I felt the ARs had a very well-balanced sound. I also listen to a fair bit of lute and harpsichord music and the ARs did an admirable job handling this kind of music. Although the ARs performed extremely well with the classical and jazz selections, what really astonished me was how they handled the Virgin remaster of "Sticky Fingers" by the Rolling Stones. The clarity and fullness of sound of this recording were, well, awesome! I have now listened to these speakers for over a year and am still very impressed with their sound. I currently use the ARs as my main speakers because I have very little room for my equipment. I have moved them around my living room--putting them in bookshelves, on the floor, and on a pair of Ikea speaker stands, which tilt the speakers at about a 20-degree angle. They sound best on the speaker stands, about a foot or two from the wall. (They sounded awfully boomy in the bookshelves.) At loud levels, the ARs do have a slightly "boxy" sound, but at the price they're hard to beat. If you can find a better product at the price, grab it! Attractive, solid, performance way beyond their size would lead one to suspect, price. Tim didn't like them. He worked at Sears and ought to know quality audio components when he hears them. These were being sold at jandr.com for $59 and shipping for months. Glad I got 'em. Now they're gone. Have to agree with every good thing I read here. I recommended them to people in home theater and audio forums as well as to friends and family members. What a bargain speaker!! Many years ago I paid $50 for a set of Boston Acoustics HD6's; thought this would be about the same value. What a surprise. These are on another level entirely. If they are powered right, they sound incredible. If not, they sound very good. I believe this is the best $75 investment I ever made. Tim from Sears Brand Central didn't like them. Can't win them all I suppose, but the rest of us are satisfied. Excellent pricing. 5 way binding posts. Very acceptable sound!! None. They beat anything in its class including some speakers at twice the price!! Bought these as a pair of 'cheap' home theatre speakers. They are impressive for the price. I was pleassantly surprised to see 5 way binding posts instead of spring loaded terminal strips. The sound from these is excellent and I am truly happy with them. The bass can't compete with my PSB Stratus Golds but then again, the Golds are more than 20x in price!! They do beat out alot of my buddies' budget mini-monitors.Can't beat these AR's for the price. Excellent value and sound. For this price and size I doubt anything out there even comes close !!!! Maybe bass- but personally I don't miss it that much. To preface, I am no audio technician, but I do know when I like the way something sounds or not. I bought these a while back on a lark. I felt I needed a smaller speaker for the size of the room I had and saw an add for these in a newspaper. The price was right enough ($58 for the pair, free shipping) to give them a try I figured. When I first opened the box, I was not that impressed, although they had a neat enough look about them. I hooked them up and was a little astonished at the sound that came out of these small boxes. For a while I kept doing double takes to convince myself that the sound I was getting was really coming out of boxes as small as these. To make a long story short, I am very satisfied with these little guys. Clean, clear sound - no distortion. I can get very loud with them and still don't detect any distortion. And the bass-- well, while its true they may lack some deeper octave of bass, I personally don't feel the lack that much. It could be that I am just used to their sound already, I don't know, but I don't find myself missing any bass at all that much. I guess they just satisfy me enough that I don't miss it. I guess all this sound with lack of distortion has something to do with that Unicone design of the Woofer and the "secret" material they use for it. In my opinion, this is a revolutionary sound to come out of speakers this small with no noticeable distortion at all. Then again, it could be that I am not an audiophile when it comes to equipment, so maybe I just don't know any better. But I am pretty thrilled at what these little guys are capable of putting out. Little Yamahas- forgot the model #. Price is reasonable, good build quality, binding posts are solid, reasonably efficient, clear sound, good deal for a secondary system, or as surrounds. No obvious audio defects that I have heard after listening to them for 9 months on a daily basis. Bottom octave is missing, but that's to be expected with such a small bookshelf speaker. I bought these on e-bay, after reading some reviews, didn't hear them. I have owned AR-6s and AR-4x in the past, and liked them a lot for the time. These speakers are extremely nice for the $. They are well balanced, clear, and do well with either tube equipment, or solid state amps. I use them as a secondary system in a den (well my den, anyway, it is the dining room/computer room of my 1 bedroom apt.!) They are moderately efficient, although I haven't tried them with very low powered tube amps, but with a push-pull EL-84 vintage tube amps (A fisher x-100) they sound great. Very good sound from a small cabinet. No stridency in the highs or midrange. Well constructed. Excellent choices for rear speakers in a surround sound system, very goos as the main speakers in a compact system. They would also mate up with a sub-woofer nicely. The response, according to the company specs, drops off at 70 Hz. I argee with that, but I didn't expect deep bass. I have been involved with audio since the late 50's. Among the speakers I have owned have been the AR4x, Deluxe Advent, Dynaco A-25, English Goodmans and others. I still own the Dynaco A-25 speakers and my son-in-law is using my AR4x loudspeakers in the music class he teaches. I am now retired and my wife and I have moved to the country and have downsized our house. Although the living room is good sized, the space for stereo speakers is limited to a cabinet that is too small for my Dynaco A-25's. After searching around and reading reviews, I decided that the AR215PS speakers might fit the bill. I purchased a new pair of them from a dealer on EBay for $50 for the pair.They are being driven by a 65 watt per channel low distortion solid state receiver. Tonight I listened to them playing a CD of Rhapsody in Blue conducted by Leonard Bernstein. While I was not astounded by their sound, I can say that they exhibited a good musical quality. The instruments were clear and the piano keyboard was excellently reproduced. Although deep bass was not there, the lower mid base was clean and not tubby. At 50 dollars per pair, they were an excellent buy, and would still be an excellent buy at twice the price. I have to run now, I've got a favorite record I want to listen to! AR4x, English Goodmans, Dynaco A-25 speakers. price, clarity, great highs, good mids. I can't hear any bass at all! Small 10 in speakers good for rears. The sound is not as full and warm as I would like, but great value. Clear sound, good midrange, great highs. Only $59 for the pair!